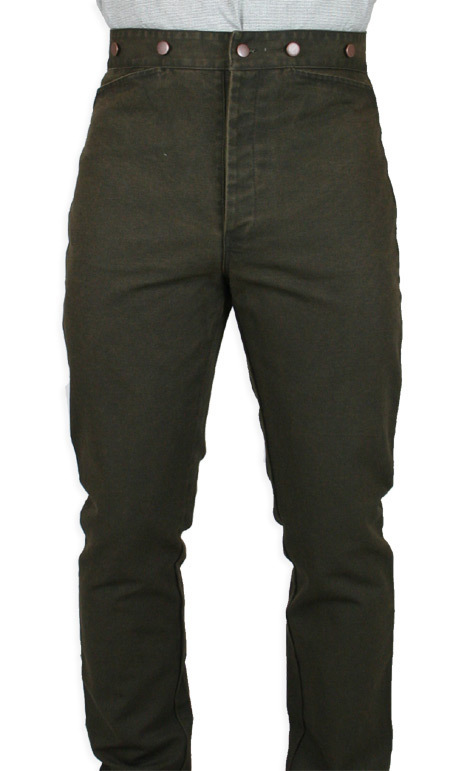 Classic Canvas Trousers – Walnut – Men! Take control of your trousers. Are you sick and tired of today’s pants?Those absurdly low cut creations seemingly designed to make your gut protrude like a sack of potatoes? Banish these fashion fiends from your life! Embrace the manful silhouette of the high-cut trouser! You will wonder why you have waited all this time! Although quite long, as the description states, I am without a doubt extremely satisfied with these pants! It is literally the best money spent on a pair of pants in my lifetime. The fact that they sit higher on ones pelvis crests (waist) gives a comfortable feel. And I like that I can down the road purchases real suspenders. 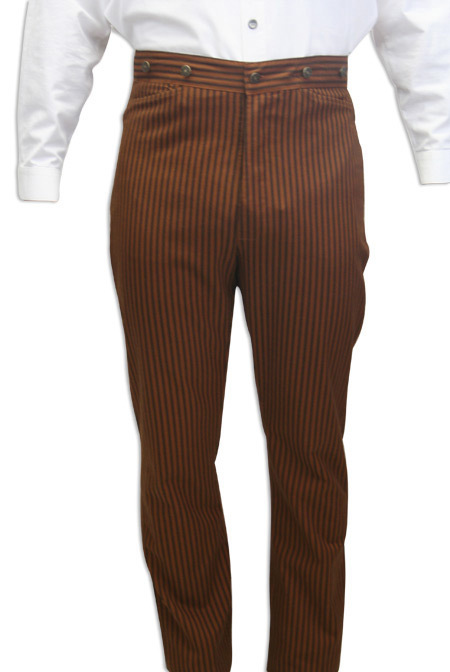 Even without suspenders the pants do not fall due to the tensioning strap in the lower back. I love the shirt. It reminds me of Guy Madison and Clint Walker when they wore similar shirts in their TV shows. I wore it at our Ft Halleck Cowboy Action shoot (SASS) last Saturday. I got compliments on the shirt. I may not have had the highest score but I looked good, shooting in my shirt! Ha! Ha! Ha! Seriously though, I searched for a while before I found this shirt. I am very happy with it. It was comfortable on the cool windy day. 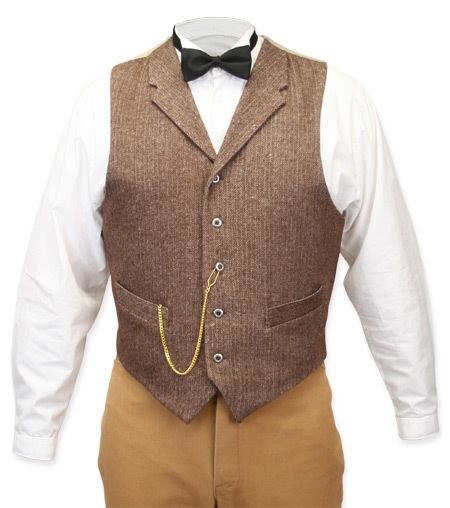 Walden Wool Tweed Vest – Perfect! My fiance and I got this for him to wear during our wedding. It is beautifully made and fits perfect. My fiance is a large guy…think duck dynasty…and it looks so good. It is fully lined, has pockets, and doesn’t have a silk back which is exactly what we wanted. It is very reasonably priced and got here fast. What a very nice, well made coat! Upon receiving, this coat is exactly as it shows in the pictures. It hangs perfectly and all seems are tight. The material is very nice, tuxedo quality. Glad we ordered this coat. If all other items Historical Emporium offers are of this high quality, I’ll definitely buy here again!! 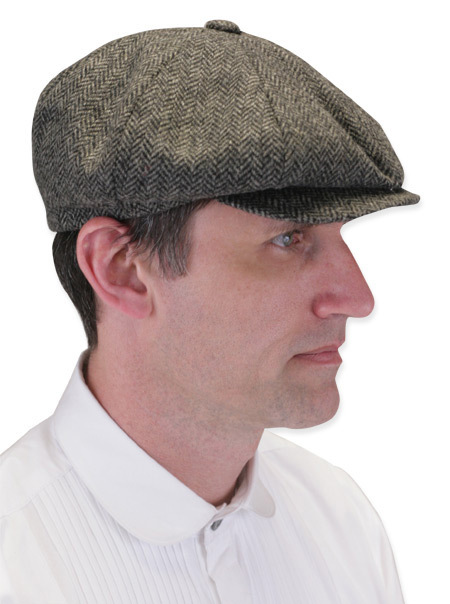 Newsboy Cap – Gray Wool Herringbone – Woo Hoo, a Newsboy Hat! I have been looking for a Newboy had for years, and was delighted to find this Website, and to purchase a Newsboy hat! I was especially pleased with the customer service/delivery, and the quality of the product. I have jealous friends, and have shared the Website with a bunch of people. You will like products and service both! BTW, if you are a Cowboy Action Shooter, take a look at their authentic Western wares for that hobby too. Glad I have their Website on my “Favorite” sites. Callahan Frock Coat – Black – This Coat was Fantastic. This coat is probably the best coat I have ever bought. I am a big fan of Doctor Who and the Frock Coats of the Victorian Era, so this was perhaps the best purchase I have ever made. Would order one again if I could. If not, I might buy a top hat and a cane to go with it. 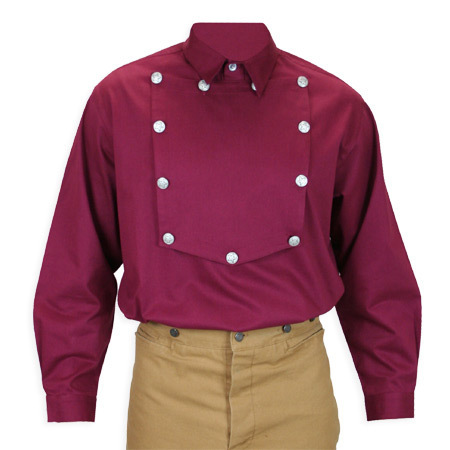 Longview Bib Shirt – Burgundy – Nice! Just wore it today and could not escape the compliments! 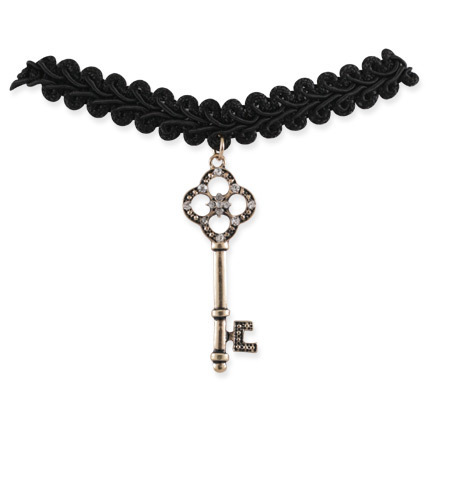 Braided Choker with Antique Gold Key – A Beauty! I love this choker and will help blend my persona from Floozie to Petticoat. 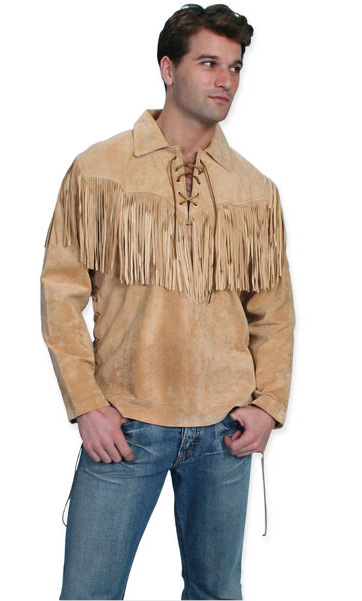 I’ve bragged about your site and am sure more of our cowboys will be checking out the site & ordering from y’all. ← Emporium on the Go!